Watercolour after an original sketch by James Hunter of the tomb of a 'Killadar' (governor of a fort) at Hoskote in Karnataka, dated circa 1792. This appears to be a preparatory drawing by William Orme for the aquatint, Plate 27, engraved by Harraden, for Hunter's 'Picturesque scenery in the kingdom of Mysore' (London, 1804-05). As Hunter died in India in 1792, the preparation of his sketches for engraving was doubtless done in England. 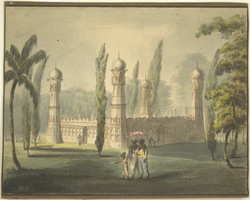 William Orme was doing similar work from 1802 to 1805 in respect of Thomas Daniell and Francis Swain Ward, engravings of whose works by Fellows, Stadler and Merke comprised the second section of Blagdon, Daniell, Ward and Hunter's 'A Brief history of ancient and modern India embellished with coloured engravings' (published by Edward Orme, London, 1802-05). Hunter's series was included as a third section in this publication.